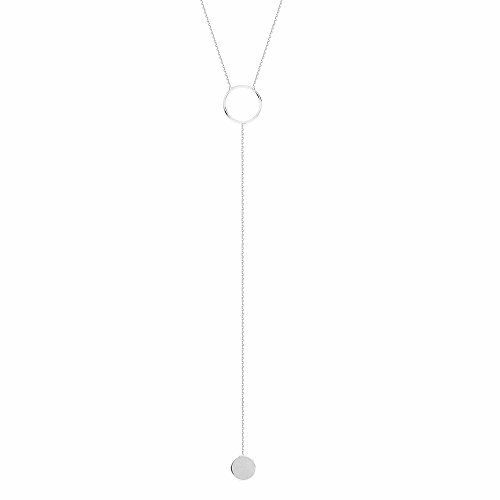 Hawley Street Y-style Lariat Necklace with Circle and Disk Drop 14k White Gold by AzureBella Jewelry at Smart Silver Stacker. Hurry! Limited time offer. Offer valid only while supplies last. Solid 14k gold lariat Y necklace is adjustable from 16 to 18 inches and drop is approximately 4 inches from the open circle, which is 12mm diameter. Solid 14k gold lariat Y necklace is adjustable from 16 to 18 inches and drop is approximately 4 inches from the open circle, which is 12mm diameter. The disk at the end of the chain drop is 8mm. This style is also available in 14k rose and 14k yellow gold. Gift boxed.